Acid reflux, also called GERD (gastro-oesophageal reflux disease), occurs when the one-way valve located in the esophagus (known as a lower esophageal sphincter, or LES) weakens, allowing food and stomach acid to travel back up to the esophagus. Normally, after swallowing, the LES opens to allow the food to pass into the stomach, and then closes to prevent the flow of acid back to the esophagus. The retrograde flow of acid often causes a burning pain, called heartburn. For this reason, GERD patients often experience a distinct burning sensation under the breastbone, which commonly occurs at night. Frequent gastro-oesophageal reflux disease accompanied by one of its common symptoms-heartburn- can be painful and uncomfortable enough to impact your daily life and cause significant damage to the esophagus. Neglected, acid reflux can damage the esophageal lining severely, cause chronic inflammation, and can even lead to cancer in the esophagus. It is thus obvious that acid reflux is a serious condition that requires immediate diagnosis and intervention. · Antacids – these come in a variety of packages: liquid suspensions, tablets, which you can chew or swallow, chewing gum, etc. These work by neutralizing the acidity in the esophagus. Their effect lasts a few hours. · Alginates create an ark that surrounds the stomach contents and reduces reflux. H2-receptor antagonists stop your gastric system from stimulating stomach acid production. They start working in 30 minutes to 1 hour and their effect lasts around 12 hours. · PPI (Proton pump inhibitors) blocks the very mechanism in the stomach cells that releases acid into the stomach. · They work temporarily. Majority of gastro-oesophageal reflux disease medications are aimed at tackling the immediate symptoms of GERD in the short run, whereas gastro-oesophageal reflux disease is a complex condition, created by a set of environmental, lifestyle and dietary factors. 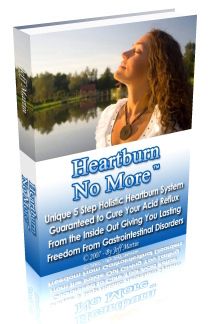 Therefore, medication can merely provide an immediate, temporary relief, while neglecting the root causes of GERD. · Long-term intake of these drugs may cause myriad side effects. Prolonged use of antacids can aggravate the damage done by chronic acid reflux: gastric acid is important for proper digestion and immunity function, and continuous intake of antacids interferes with these processes. While their most common side effects include severe headache and diarrhoea, PPIs have also been linked to osteoporosis. Acid reflux medication therapy is based on the conventional approach that unlike the holistic approach doesn't treat the body but instead focuses on the symptoms of the disease. This is why most gastro-oesophageal reflux disease medications will provide nothing more than temporary relief along with myriad side effects. On the contrary, holistic treatment will fix the internal cause of acid reflux, thus preventing its recurrence safely and effectively.